So, almost 3 weeks later and I'm finally up and running! I delayed updating here as I wanted to bring a positive outcome. Unfortunately, the journey wasn't without its problems. The HMI module I ordered was delivered very quickly, but when I plugged it in, it threw a "Calibrate Device" error, and the radio wouldn't start up with it installed. Mike (dokus223) was great to work with, tho, and took the module back, verified that the programming wasn't right, reflashed the VIN and got it back to me. I got it installed tonight and (after a brief red "No VIN" msg pause to make me flinch) it's working great! I tested both AA and ACP and both have full functionality for me. It seems the HMI is from a newer truck than mine since it adds some functions other than AA & ACP. App downloads, myChevrolet connectivity, and WiFi connection to name a few. Wifi connects just fine, but the others I note won't connect. I'm curious to know whether those will even work with my config; any thoughts? No big deal for me since my primary goal (AA) has been met. I never considered 24's for my truck so had to check out a few pics. Not my thing, and it seems that that would be a terrible experience IMO for towing and hauling. But some of the applications look pretty slick. Guess it depends on what rims and aesthetic you're going for. In theory, you could wire them into the reverse lights (since those come on as a part of the "perimeter lighting") I guess. The plug for the box lights is in a plug set just behind the spare tire, so you could cut and splice from there to the tail lights. For me, I have a tonneau cover, so I want them to come on when I open the tailgate. I have the lights spliced into the power of my 7-way trailer plug and switched by a magnetic switch so that they come on when the tailgate is opened. Couple options, at least. I wanted to find a seller who could flash the HMI with my VIN, and most can't (or won't). I ended up paying $225 plus shipping for the deal. More than twice what some have paid since the beginning of this thread, but a LOT less than the $800 to $1200 price I was looking at with a complete radio upgrade. I was fine with that price given his rep. Tracking shows I should have the HMI by Thursday, so I can let you know by Friday how it goes. With any luck this will be working smoothly and I'll be testing out full android phone access in the 1500 by this weekend. Just found this thread today and read through the whole thing. Some great info here, and most importantly, enough explanation and research to save me a lot of money. I was planning to buy a whole new radio and HMI (MVI was the most likely seller) which was going to take time to save up for. 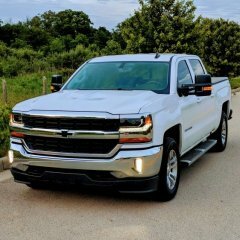 As it turns out, I was able to verify that my 2016 Silverado was one that suffered from insufficient stock syndrome. That's a LOT more manageable, so I just ordered a 2.5 HMI from dokus so will hopefully have AA by next weekend. I'll let you know if I run into any problems. Thanks to @Darmichar for starting the conversation! I'm guessing it has helped a lot of people out (me included). And thanks to everyone who contributed, especially @th3magpi3. Thanks, Phil, once again for your help. 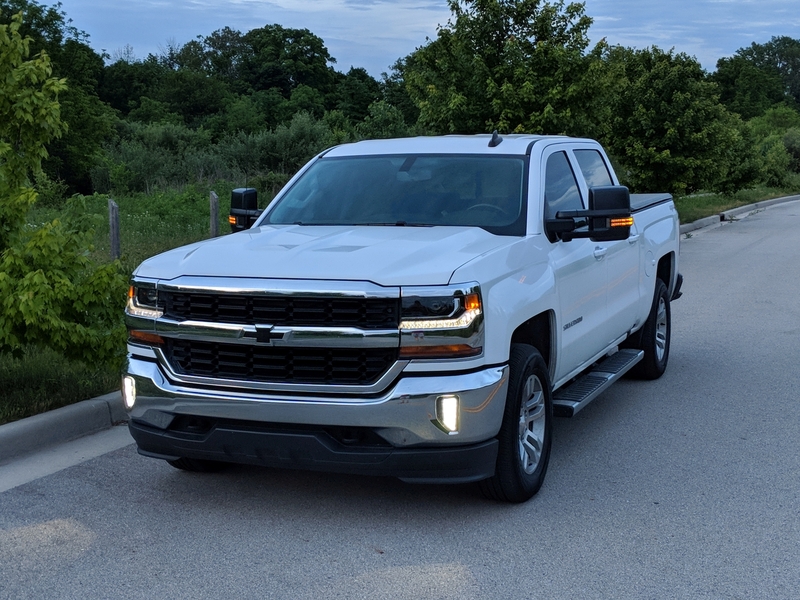 The reality is that there's not much you can do to a white truck to make it more than it is - a truck - but the mirrors make it a bit safer for me and the fam while I'm towing. Appreciate what you do for the community. So for me, the long weekend is a break from the hectic day to day... and the time I needed to finally get the tow mirrors installed! Thanks to @Aaron1121for the mirrors themselves. They were just what I was looking for. And of course to @pgamboa for sending out the DIY kit for the harness modification. Everything worked exactly as expected! Of course, I probably spent more than double the time a normal person would take just for triple and quadruple checking the connections. Plus I modified the wiring slightly to add the front park/signal upgrade. Weird as it sounds, I actually enjoyed the project, and @pgamboa's instructions made it easy. If I can get it cleaned up, I'll post a pic later this wknd. I hope everyone has an awesome holiday weekend!